In a rare show of reasonability, and of decent salesmanship, I set up a Transformers display at my local comic shop (as you may remember from a different post). What differs this year from others is that the figures are for sale, and I've actually been able to move a few. This has encouraged me to snap a few additional pics as things go out the door - for posterity sake and to be sure they are adequately Preserved. 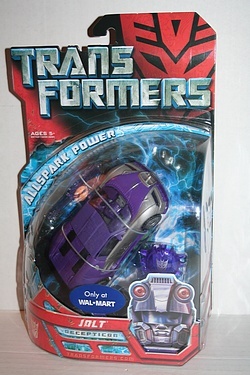 Here, then, we have the Walmart Exclusive figure of Jolt, from the line of toys to accompany the very first live action Transformers movie. Oh - what a long time ago that seems to be. Before Devestator's balls. Before Robot Heaven. Before whatever happens in movie #3 that I haven't seen yet. It was a simpiler time, to be sure and one that, with the benefit of hindsight, we are now able to look back upon kindly. So click through the image below, and learn more about this 4 year old exclusive figure! I have him. Was using him as a Stunticon before they put out a real Dead End and Wildrider. I can see that - good choice!